Recently we gave a neighbor a bag of extra lettuce and he turned around the next day and gave us a bag of fresh trout. Anna is not a lover of seafood like myself, but she didn't hesitate to clean up these three trout for dinner the other day so I could have a treat. It was delicious. Makes me wonder if raising trout in an aquaponic setting might be possible for us. Aquaponics is high maintainence. If you want to keep it simple I suggest digging a pond, stocking it with bass and bluegills (or koi if you just want to look at them), and pumping the pond water to an aquaponics system. We have 2 small ponds on our property where we raise blue gill. Small but plentifull. Would like to hear how you would raise fish without using a lot of chemicals to keep them healthy. I'd probably NOT do trout. I've kept aquariums for a while and trout need colder, continuously flowing water to get enough oxygen. We've tried to keep trout in our tanks and they didn't get enough aeration to keep them alive. Maybe Carp or Tilapia. I hate fishy "fish" but I'll eat Tilapia. I wonder how long they would need to grow to eating size? We have a lake in Oklahoma that stocks trout over winter... Maybe you could do tilapia during the warmer months? I am clueless about raising fish just thinking outloud. The creek that runs beside your barn would most likely be cold enough year-round for trout. Anonymous --- It's not really cold enough. It runs aboveground for quite a way before reaching us and doesn't have that ice cold feel of spring fed creeks. A friend of mine that lives a bit north of me raised largemouth bass in a above ground pool for a couple of years. I think he decided it wasn't economically feasible but he was trying it for profit. If I recall, he did break even though... value of the meat after sale and investment. So, when one is not looking for profit but rather sustenance, maybe the numbers work a bit differently. So, if you wanted to raise fish in something other than a dug pond, perhaps you should look into a species other than trout... I've seen a few recommend tilapia, bream/bluegill, and bass. I think tilapia would require warmer temperatures (but that's not even really an educated guess) but several other species should do just fine for you. My friend was selling the bass to local restaurants there, and I'm not sure what permits he had to get to do it... but like I say he was able to break even in the end. So, it might be another supplemental form or nourishment that could pay for itself? One other question... does the creek have a natural supply of fish in it? You might be surprised what's in there. I've been spending a lot of time at my uncle's 12x20' cabin near Hattiesburg Mississippi on ten acres. It has languished for many years and was almost taken over by nature (trees, brush, termites, hurricanes, rats, possums, birds, etc.) until my cousin and I sort of adopted it a year ago. We went up for 10 days in mid April and he suggest we run a trot line in the creek that runs behind the cabin. I'd say the flow rate of that creek is much more variable than yours, but flow rate is probably about twice that of your creek. Anyway, I didn't think we would catch anything in there... but I said sure, lets try it. Every morning on checking the line we had one 2 lb catfish. The last night we ran the line we had a 2 lb and an 8 lb. Point is, there may be more lurking in your creek than you might guess since I had no inkling there was fish to that size in that creek. I don't remember if there are any deep holes in your creek nearby? Shannon --- Very interesting to hear about a small-scale commercial fishery! Interesting that your creek will sometimes completely go dry. I had assumed it flowed continuously. As for the small scale commercial fish farm, the friend that was doing it had a stroke about 5 years ago, and was a large factor in his not continuing that endeavor. It might be worth some research for you since you have a flowing water supply nearby. He was raising the bass in a ~20' diameter 4' deep above ground pool. As for my uncle's cabin, my cousin and I are debating on trying to buy the place from him. My uncle is no longer physically able to use the place due to health. I wonder if that is my way out of the rat race? As I've said, the creek has fish in it, and just below is a larger creek of which it is a tributary so one could have a garden and do quite a bit of fishing for sustenance. There's also deer and turkey there... and some of the soil is pretty good. Other bits of it are clay and sand. He once had cattle on the land, and with not too much effort it could be prepped again for some livestock. It's only been the last year or so that my cousin and I have been invited to make use of the land and it has been a welcome getaway. It's about three hours from my house and is close enough for weekend trips. We've got the cabin rehabbed enough that we're able to leave items there now so it's just a matter of throwing a few things in the vehicle and going now. 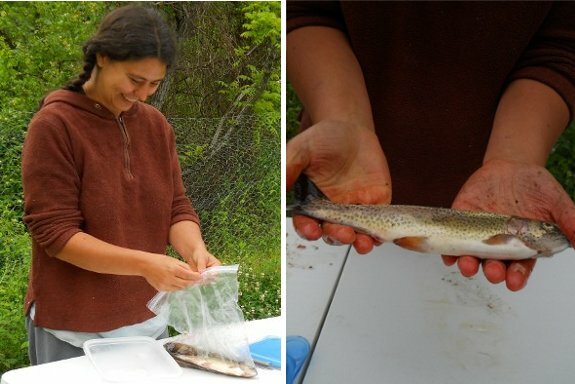 U.S. Production USDA National Agricultural Statistics Service (NASS 2012) reported that 754 trout-rearing farms were located in the United States in 2011. Fish sales that year totaled $76.6 million, an increase of 7 percent from the previous year. Idaho recorded $38.2 million in trout sales, the highest total of any state, which accounted for 50 percent of U.S. sales. North Carolina ranked second with $6.3 million in trout sales, followed very closely by Pennsylvania with $6.2 million and Arkansas with $5.1 million. The products of trout culture include food products sold in supermarkets and other retail outlets, live fish for the restocking of rivers and lakes for recreational game fisheries, and products from hatcheries whose eggs and juveniles are sold to other farms. Food market fish size can be reached in 9 months, but 'pan-sized' fish, around 1 pound, are harvested after 12 to 18 months. Optimal harvest size in the United States is generally 1.5 pounds. Trout are marketed as fresh or frozen whole fish or fillets (often boneless) and as value-added products, such as smoked trout. IMO I think you have some great pond sites between your house and the creek. You could get a pond dug in a day and then let pigs do the sealing for you. That's how we plan to build our second pond below the one by the house. There are so many small-mouth bass, bluegill and catfish in our pond you can hardly cast without catching something. It really takes the sport out of it, but is great for a quick last-minute fish dinner. I'm sure you've thought about all of this already but I thought I'd give my two cents because I've been pondering another pond lately too. This one would we'd try to do some microhydro since it would be fed from the outflow pipe off the pond above it, which has a good drop and plenty of pressure, though not a huge amount of flow during certain times of year. Shannon --- Sounds like you've got a good opportunity to enjoy that land! I'm excited for you! Everett --- The question is, how much maintenance would a pond take? I agree that it probably would be a lot lower work than a real aquaponics setup, and I find it enticing because we could potentially put some fruit trees around it and use the water to mitigate late frosts. I'll look forward to hearing about your microhydro project! Shannon --- That's very good to hear! Maybe I'll get to add one to the list one of these days.